A majority of businesses are using some form of marketing automation nowadays — in fact, studies cite around 51% of businesses currently use the technology, and that number continues to grow. According to a 2018 Forrester report, 55% of marketing decision-makers plan to increase their spending on technology, with one-fifth of the respondents expecting to increase by 10 percent or more. All of which is to say — if you’re not using marketing automation software in 2019, you might want to reconsider. Despite the necessity of automation software, it’s a complicated space, full of different software solutions with various features, and use cases. Here, we’ve cultivated a list to help you sort through your options and feel confident choosing the best marketing solution for you and your team. Of course, HubSpot has a full growth suite that includes sales software, marketing software, and support software, which all integrate automatically with HubSpot’s free CRM. The combination effect of having all of your data and growth activity in one place can unleash tons of creative automation possibilities that would be difficult or impossible if you use separate tools. It can take time to master the tool (you’ll scale-up more quickly with the help of HubSpot Academy), but once you get a grasp on it, the creative possibilities are endless. You can set up simple email list autoresponders, or build a smart and complex network of rules designed to target specific users with the exact right email, live chat, website experience, and more. Basically, the workflows tool is automation beyond email, so you can scale your growth and spend less time on repetitive tasks. 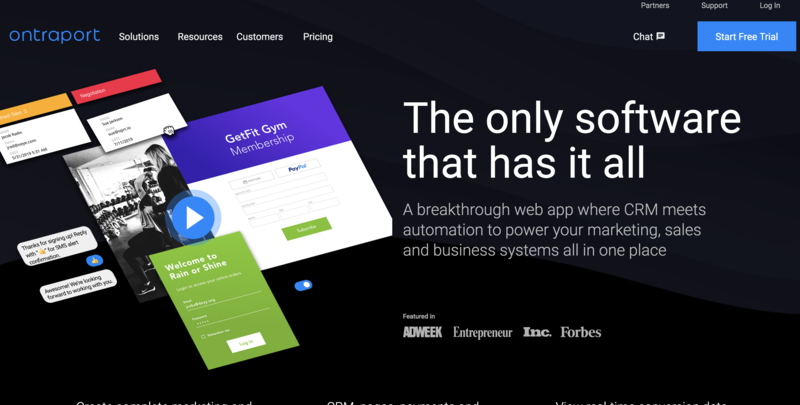 Ontraport is a business automation software for entrepreneurs, solopreneurs, and small businesses. One of the most valuable things Ontraport offers is their focus on reporting and insights. While some tools can be a bit of a black box, Ontraport gives you a clear look at the performance of your campaigns. 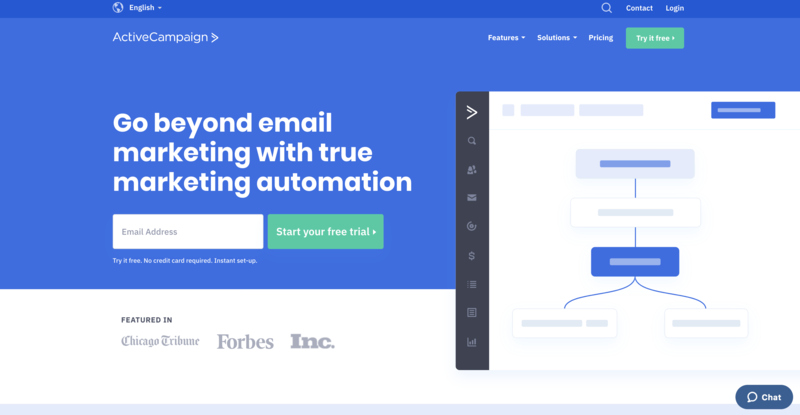 SendInBlue started as a digital agency but ended up building quite a powerful email marketing tool, which, with time, transformed into a well-liked marketing automation software. They have some advanced features, such as their reporting and lead scoring. Additionally, SendinBlue offers a pretty impressive free plan, which includes basic marketing automation functionality, phone support, and up to 300 emails per day. 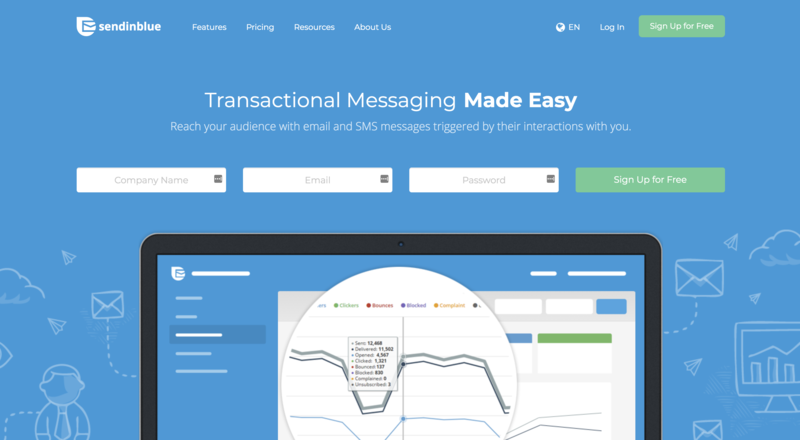 You can also run SMS campaigns from SendInBlue. ActiveCampaign is an integrated email marketing, marketing automation, and small business CRM. The strongest point of ActiveCampaign is their powerful and flexible marketing automation functionality. It’s one of the most comprehensive solutions on the market. Their deliverability is rated as one of the top on the market, as well. This probably isn’t a good tool for beginners, or those with low technical capabilities. It takes a bit more time and effort to learn — but when you do learn the platform, it’s pretty powerful. Pardot, part of the SalesForce empire, is a powerful cloud automation solution that mostly serves enterprise clients that have the technical resources and time to learn the platform. They have a ton of powerful features, from CRM integration to email marketing, lead nurturing, lead scoring, and a valuable ROI reporting functionality to make sure your campaigns are working. You can track all interactions on your website and build predictive lead scoring based on the parameters you set. All of this helps improve marketing efficiency and remove wasted time and effort from your sales team. It’s important to note, Pardot is a powerful enterprise but may not be as accessible or affordable for smaller businesses, or entrepreneurs. 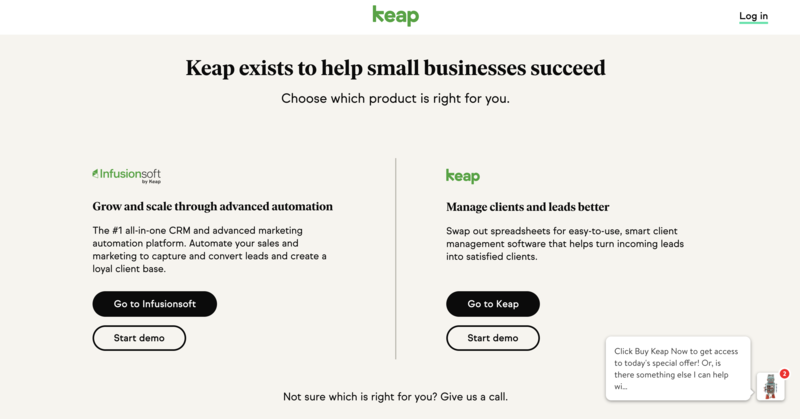 InfusionSoft (now Keap) has been around for a while (15+ years, I believe) and has helped thousands of marketers deliver on leads, revenue, and customer acquisition targets. They really flourish in the small business and solopreneur crowd, and in my experience, I’ve noticed they have a pretty sophisticated user base. You can set up relatively complex decision trees depending on which lead magnet someone signs up for, how many (and which) emails they open and click, or other contact property data. 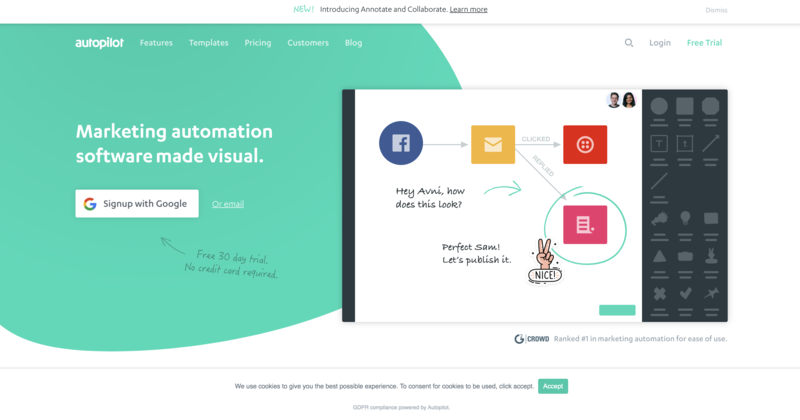 Autopilot is one of the most visually appealing marketing automation solutions on the market. 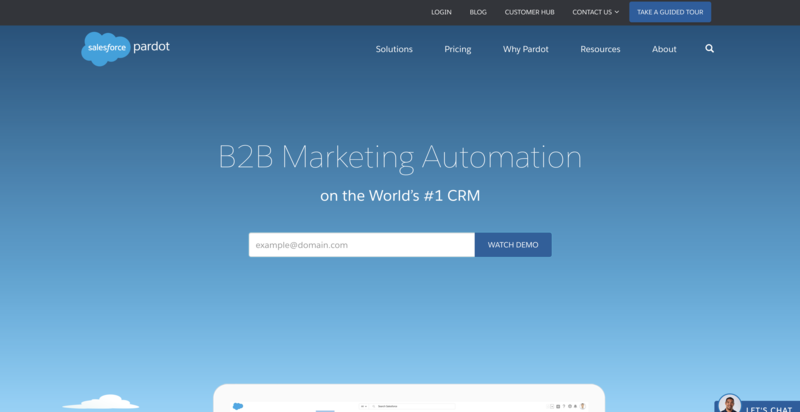 They make an email marketing, messaging, and automation platform, and they bill themselves as the easiest marketing automation platform to use. As mentioned above, their visual editor is clean, easy-to-understand, and frankly fun to use. Of course, their platform is typically used for more sophisticated messaging and targeting, but you can also create a simple autoresponder based on a time-sequence. 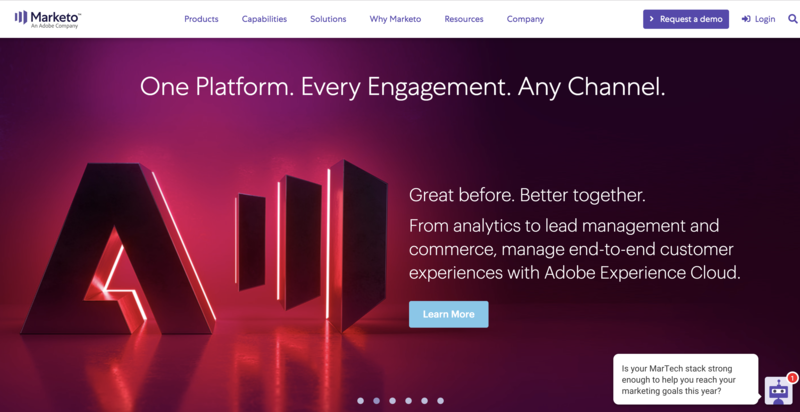 Marketo has been around for a while, and was recently acquired by Adobe and incorporated into their enterprise marketing cloud. The Adobe integration means that, if you use Adobe Analytics for data measurement and Adobe Target for experimentation and personalization, you’ll have a powerful enterprise marketing automation and optimization suite. However, the tool is typically geared towards enterprise customers — it’s a bit out of range for most small business owners. GetResponse is easy-to-use and you’ll typically find good results from the tool, although it works best with the simpler features, like email newsletters. It can become trickier to work with the platform if you plan on implementing complicated conditional logic and marketing automation. They also excel in personalization and analytics. 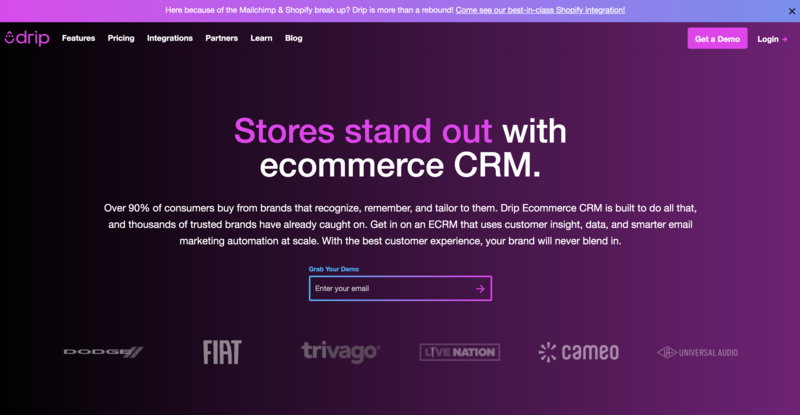 Overall, Drip is a powerful tool for e-commerce marketing automation. 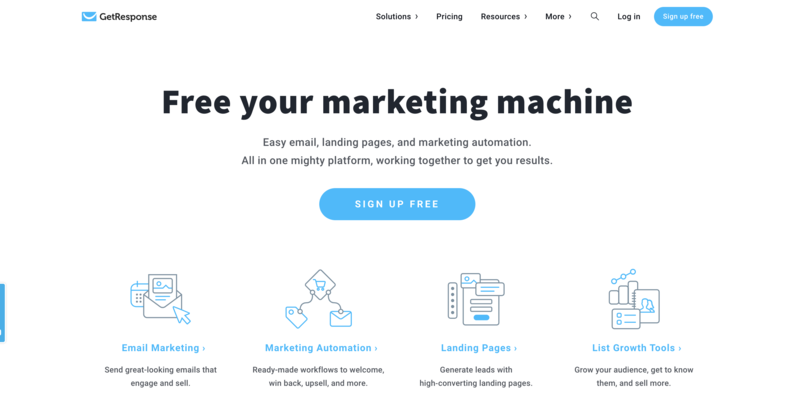 Mautic is the only open-source marketing automation platform in this list. It’s also a relatively new player, only founded in 2014. They’ve grown quickly, though, and are seemingly picking up steam with high tech companies. 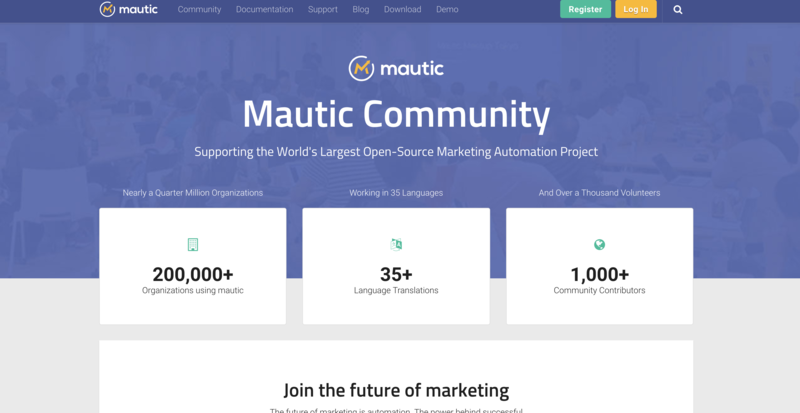 Currently, over 200,000 organizations use Mautic. There are tons of options for marketing automation software. It’s all about choosing the right one for your business purposes, budget, and technical expertise. Want something incredibly powerful and limitless? It may end up costing more, and taking time and effort to learn. The cheaper options, by comparison, might have too limited a scale. Ultimately, it’s a trade-off. Whatever you end up choosing, I’d be remiss to neglect suggesting you check out HubSpot, or at least start with one of our free marketing tools.